Rules of Golf: Whose Ball Is Used in Ryder Cup Foursomes? Whose Ball Is Used in Ryder Cup Foursomes? Please excuse me while I proudly point out the significant role that the Irish played in Europe’s comprehensive Ryder Cup victory. Despite having only ~½% of Europe’s population, Ireland provided the Captain, two Vice-Captains and two of the outstanding players for the European team. My congratulations to Paul McGinley, Rory McIlroy, Graeme McDowell, Padraig Harrington and Des Smyth, not forgetting the rest of this magnificent team. Thankfully, there were no Rules incidents of any note over the three days of competition, although this link shows that an over-enthusiastic forecaddie may possibly have improved the lie of Garcia’s ball in the rough by parting the grass around it. However, I was asked a Rules related question about the foursomes, which I think will be of interest to readers. Generally, tour events operate the ‘One Ball’ Condition of Competition, which restricts players to using conforming golf balls of the same brand and model throughout their stipulated round. However, back in 2006, this was relaxed for the Ryder Cup, the President’s Cup and similar events, so that in foursomes players were permitted to switch types of golf balls between holes. Of course, once the hole is started, the same ball (or type of ball) must be used to complete the hole. (Edit October 1st 2014: I have just been advised by a Ryder Cup referee that as the 'One Ball' Rule does not apply in this competition, the side can change from one brand to another, if they for example hit their tee shot into a water hazard or declare their ball unplayable.) 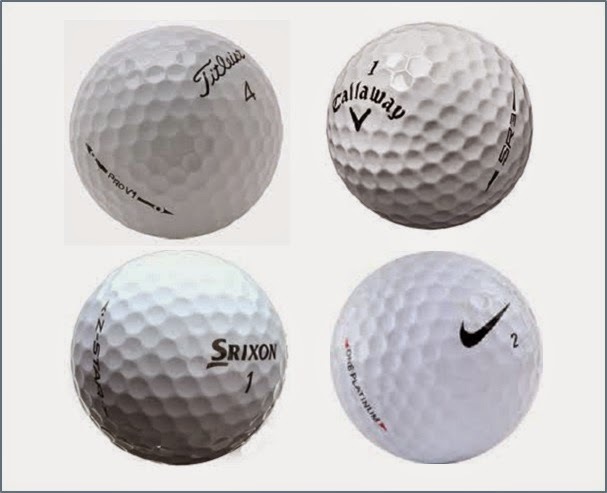 This raises the question as to whose type of ball will be used by tour professionals in foursomes (alternate shots), as they use a wide variety of balls. I understand that on the US team, Hunter Mahan and Rickie Fowler both use a Titleist Pro V1x, Jimmy Walker uses a Pro V1. Keegan Bradley plays a Srixon Z-Star and Phil Mickelson plays a Callaway Speed Regime 3. The interesting answer to this question is that the players usually agree to tee off using the ball favoured by the player who will be hitting the shot into the putting green. Apparently, the performance of premium balls does not differ as much when being driven from the teeing ground, as it does when being played with an iron to the green. Unless there is a ‘One Ball’ condition, or a condition that the ball the player plays must be named on the current List of Conforming Golf Balls issued by the R&A/USGA, a player may use any ball that conforms to the requirements specified in Appendix lll, Rule 5-1. It is a myth that players may not compete with X-out balls, refurbished balls, range balls or lake balls, providing these balls conform, as above, Decision 5-1/4. There is nothing in the Rules that prohibits a player from borrowing golf balls from another player during their round, Decision 5-1/5. A player must not apply any foreign material to their ball for the purpose of changing its playing characteristics, Rule 5-2. A ball is unfit for play if it is visibly cut, cracked or out of shape, it is not unfit for play solely because mud or other materials adhere to it, its surface is scratched or scraped, or its paint is damaged or discoloured, Rule 5-3. Did you know that you can purchase all 99 weekly issues of my 'Rhodes Rules School' photo series, as a single eDocument? Click here for details. The above content is strictly copyright to Barry Rhodes © 2014 and may not be copied without permission. This the first time I have had a rules query without resolving it using your blogs, ebooks, etc. In a four ball Matchplay where teams are in carts and an opponents ball is run over and moved (not during a search)- penalty is one stroke but against which of the team members - we resolved it by the driver of the cart accepting the penalty but am not sure if was the correct approach ? keep up the marvellous work. Your ruling was correct. Decision 18/8 confirms that while a cart is being moved, the cart and everything in it are deemed to be that player's equipment. As the opponent's ball was moved other than in search for it, the person moving the cart incurs a penalty of one stroke and the ball must be replaced where it was.